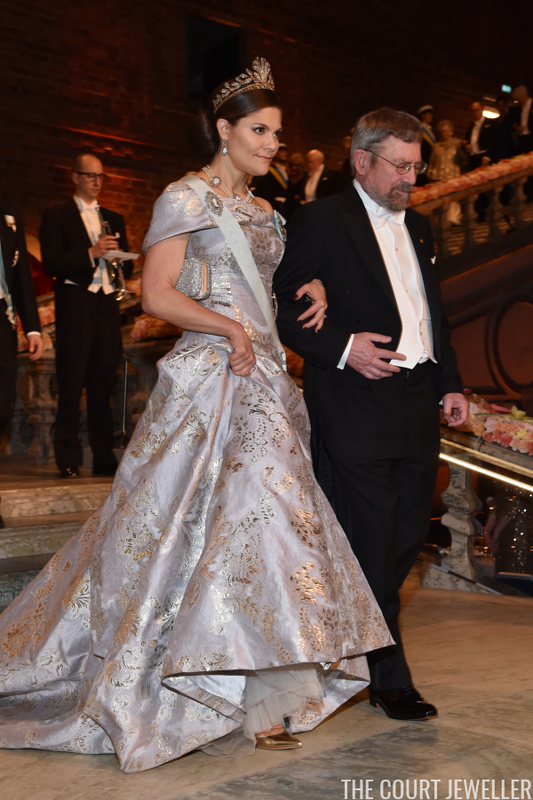 In my opinion, we've saved the very best Nobel jewels and gown for last! 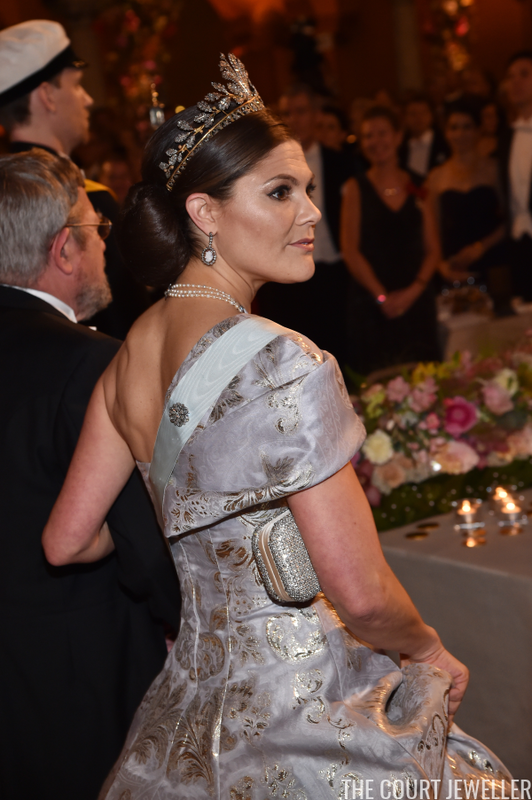 Here's a closer look at the inventive jewel pairing chosen by Crown Princess Victoria for the Nobels -- and that gown! 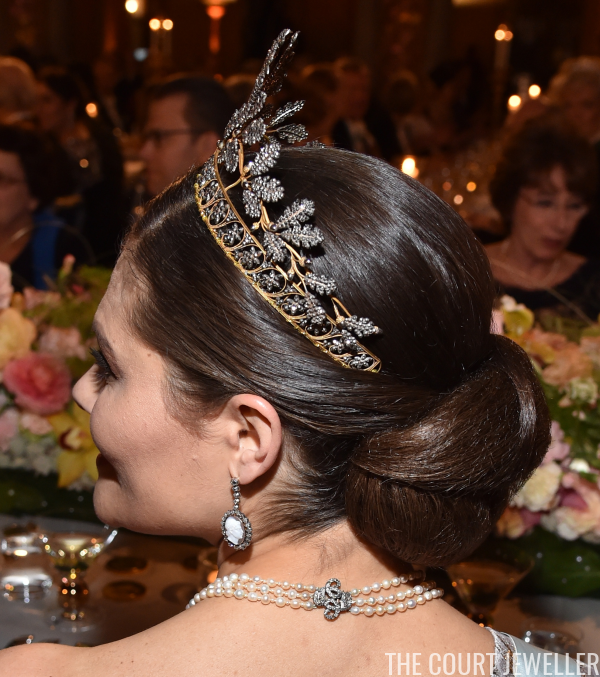 Victoria wore the larger Napoleonic Cut-Steel Tiara, a piece she's worn with relative frequency over the years. The tiara combines gold with highly-polished steel, and it manages to sparkle without a single diamond. 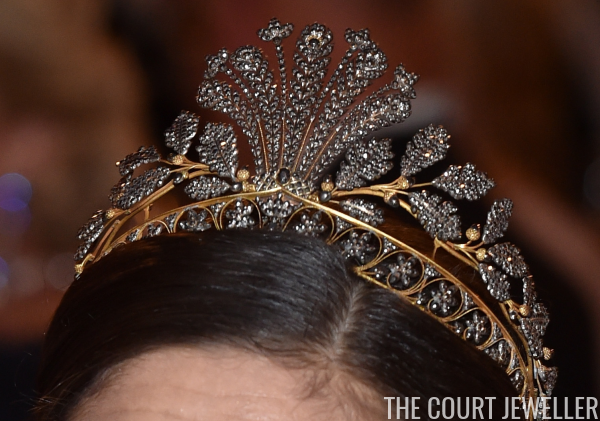 As the tiara's name suggests, it dates to the Napoleonic period, making it about two centuries old. 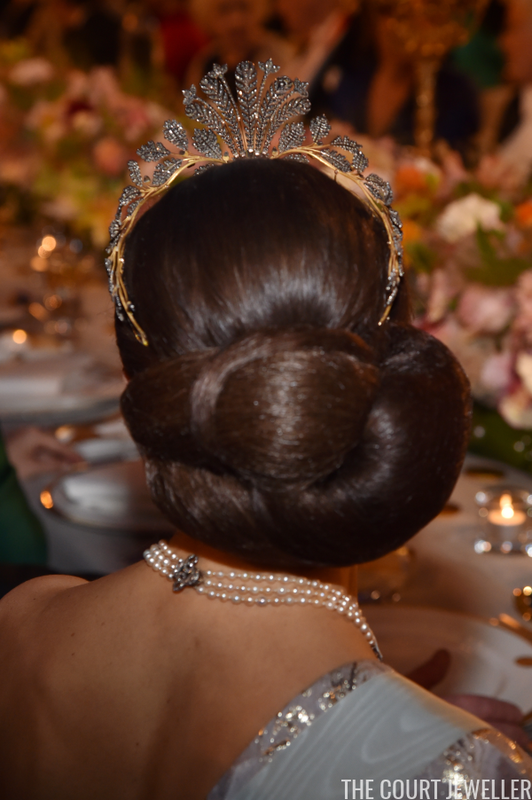 And here's the hair and the tiara from the back. And here, a nice view of the necklace's ornate diamond clasp. 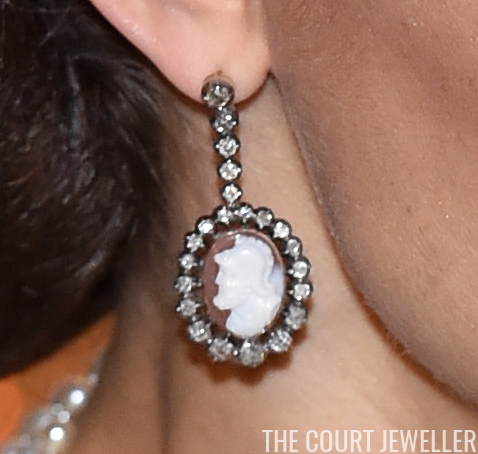 Victoria wore the earrings from the set, shown in detail above. 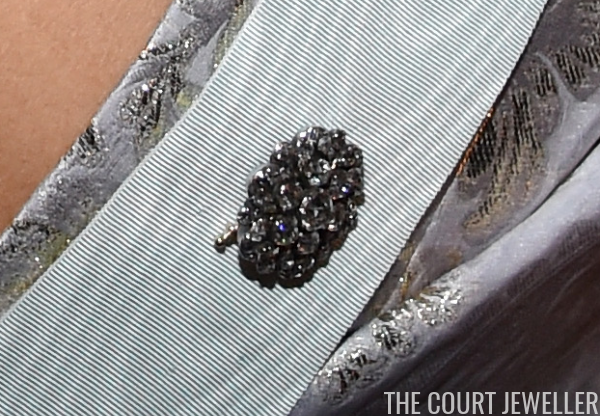 She also wore the suite's bracelet on her left wrist. Also on that wrist: a delicate silver bracelet. You can also spot her engagement and wedding rings here. 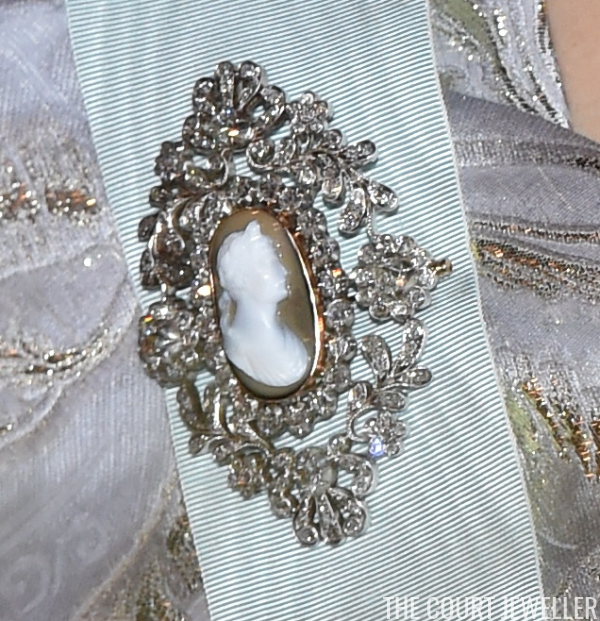 And she secured her Order of the Seraphim sash with the brooch from the set (which was possibly a later addition to the suite). 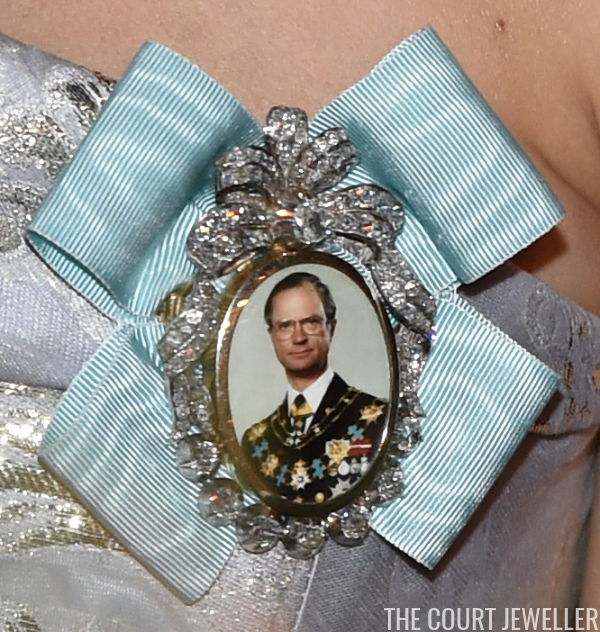 She pinned the back of the sash to her gown using a diamond rosette brooch. Here's a good, detailed look at Victoria's family order badge, with its specific portrait and diamond frame. And now: the gown! 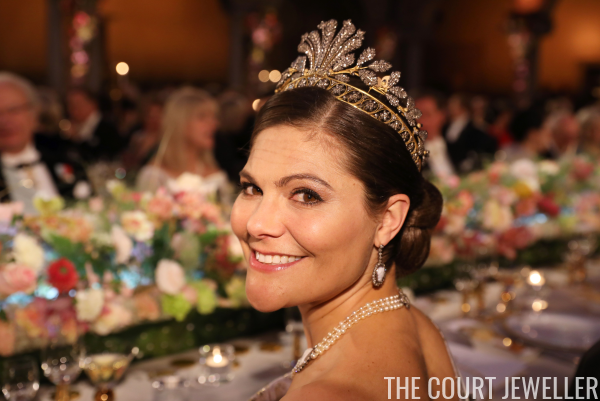 The dress is a custom design from H&M, featuring golden embroidery on a light gray base -- gold and steel, just like the tiara. The piece was made using sustainable materials. Just one look won't do it justice; here's another angle from the Nobel ceremony, where you can really see the train. And one more of the back of the gown, just for fun!